History - Duvauchelle Seaside Motel "Comfort by the Sea"
The site of an ancient Māori pā or fortified settlement is at Oinako, where the Duvauchelle Hotel stands today. At Te Wharau creek, a taua or war party of Ngāti Awa warriors camped during the battles led by Te Rauparaha in 1831. The name of the town and bay comes from the surname of two brothers, who held land there from the Nanto-Bordelaise Company, at the time of the French settlement at Akaroa in the 1840s. It is thought that the brothers never lived there. In the following decade, land alongside Duvauchelle Bay was leased from the Canterbury Association by British settlers, including William Augustus Gordon, who was the brother of Charles George Gordon, the famous soldier and colonial administrator, known as "Gordon of Khartoum" after his death. The first freeholds were bought in 1857; economic activity was focussed on timber extraction and sawing, mostly totara trees. Domestic pigs were grazed in the forest, who mingled with the feral pigs that were already present. As the tree cover was cleared, it was replaced with pasture. The first settler at the Head of the Bay, the location of the present town, was a Frenchman called Libeau, who arrived in 1841. Timber exploitation was also the main activity, as well as boat building. The sawn timber was all carried out of the bay by locally built vessels. A public house and a shop were built in the 1850s. A small building that served as both church and school was built by local people on a half-acre plot of land donated by Lord Lyttelton. The first permanent roads began to be constructed in the 1860s and 1879 saw the arrival of the County Council offices and the Post Office. 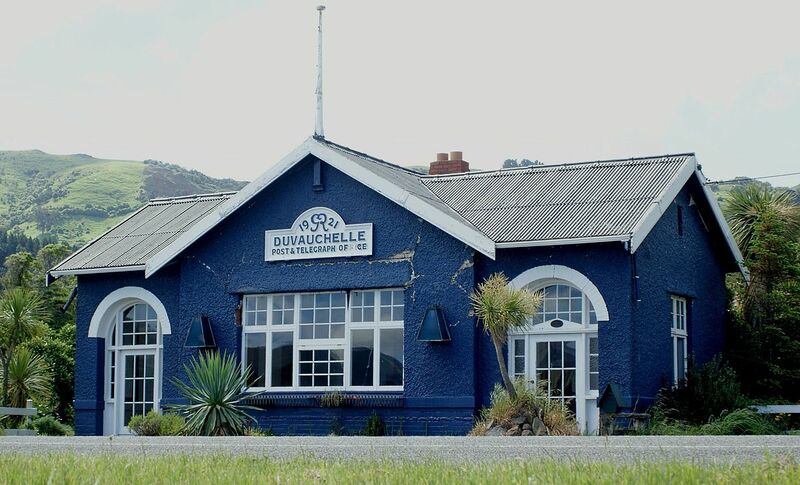 Both the Duvauchelle Hotel and the post office were badly damaged by the earthquakes that struck the region in 2010 and 2011. The oldest parts of the hotel were demolished after the earthquakes, the remaining parts of the building were reopened as a single-storey establishment in September 2013. ​ The Post Office was demolished in late 2012. The distinctive whale-shaped peninsula that juts out into the water was the site of a bloody massacre when it was invaded by the Ngāti Toa chief, Te Rauparaha in 1832 following the sacking of Kaiapoi in 1831. Situated on a peninsula the pā was surrounded by the sea at high tide. It could easily be seen from the surrounding shores, and it was on both sides of the peninsula that Te Rauparaha would establish his Ngāti Toa (Barry’s Bay) and Ngāti Awa (Head of the Bay) warriors prior to the battle. Many Ngāi Tahu had sought refuge at Ōnawe after the decimations further north. The pā had 3 defensive areas: an outer wall at the neck and two main citadels higher up the crest. This formed the main defensive area defended by ditch, bank and palisade. Two long protected trenches ran to springs on the western side of the pā for water supply, with canoes also utilised to store additional water. The pā was well provisioned with many whata (storehouses) and rua (storage pits) to withstand a siege. There were 400 warriors and numerous women and children protected there. Tāngatahara was in command of the Ngāi Tahu defenders in the fortified pā. A full-on attack was unlikely, yet Tāngatahara decided to lead a surprise assault against the Ngāti Awa warriors in their encampment. The assault was foiled when sentinels on the hills above gave the alarm to Ngāti Toa. Now under attack himself, Tāngatahara was forced to retreat. There are conflicting stories about how the Ngāti Toa and Ngāti Awa warriors gained access to the pā itself. Jealousy, trickery and incompetent leadership have been suggested as reasons. There was disorder and mayhem after the retreat, and the northern warriors gained access to the pā and the killing began. Few Ngāi Tahu survived the day, only the young and strong were taken for slavery, the rest were slain on the flax flats at Barry’s Bay and the Head of the Bay. Te Rauparaha returned to Kapiti with the captives. On the way one of the boats stopped at Gough’s Bay for repairs and it was here that Tāngatahara made his escape by diving into the sea and fleeing into the bush. When Ngāi Tahu taua (war parties) under Taiaroa were organised for the next fighting season in 1833, Tāngatahara would go with them to oust Te Rauparaha from his encampments in the north.